Colored planks are an additional $21 per linear foot of total seat and foot planks. Additional freight to your exact location applies. VOLUME discounts apply to multiple unit purchases. I price the units at a very small margin and figure exact freight to your destination to make you the best deal possible. Do not pay one flat price that includes shipping. I will beat that price by hundreds! 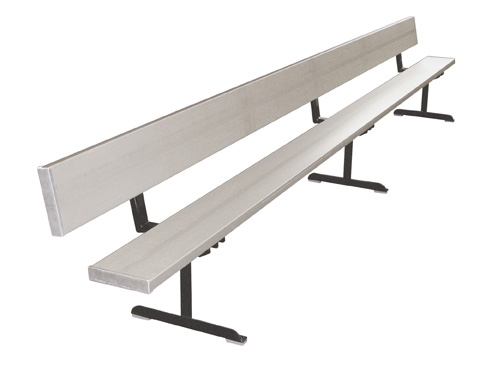 All Teammate player benches use 9 5/8" x 1 3/4" anodized aluminum planking for seats and backrests. Support legs and backrest brackets are powdercoat painted black, steel construction. Legs are spaced on 6'0" centers. Portable player benches include rubber floor protectors to prevent floor damage. Teammate player benches are available in 8', 15' and 21' lengths with and without backrests. 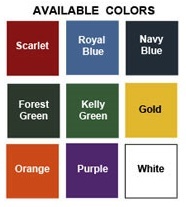 For added school spirit, consider ordering benches in custom colors. First Team can powdercoat seat planks and backrests up to 21' lengths in a variety of colors: Scarlet, Royal Blue, Forest Green, Kelly Green, Gold, Orange, Purple and White. Choose the Teammate player bench that meets your seating needs. See chart for seating capacity. All Teammate player benches are covered by First Team's Lifetime Limited Warranty! Fill out and submit this form and I will follow up with exact freight and everything else you will need to know to proceed. Thank you. Comments - Be as descriptive as you can. Dimensions, quantity, your application, etc. I'll contact you immediately with helpful information, freight and total price. All of our wall pads are professionally made with a 2 " thick 100 ILD Polyurethane foam bonded to 3/8"thick MDF backer board and covered with 14 oz. Polyurethane Fire Rated vinyl. A 1" lip at the top and bottom of each pad make for easy mounting to any surface. Aluminum Z-Clip, and Velcro also available for mounting lipless pads. Special sizes, school logos, graphics, and cut-outs for outlets, vents, etc are available upon request. Please contact me via this web site or give a call toll free if I can answer any questions. I assure you I can put you in the best system for your needs and provide complete padding solutions for any type of facility, and no one will be more helpful as you sort through sourcing your equipment needs.